I was tagged by Sue Vincent at Daily Echo to participate in a free style writing challenge. My question was: If you could visit, for just one day, in any era and location, past, present or future, where would you go and why? I would go back to pre-colonial America. I would love to see what our land looked like when only the Native Americans possessed it. I read once that you could travel from the Atlantic coast to the Great Plains under tree cover, except for crossing rivers. I would love to see and experience that! See what birds, animals and plants were native and untouched by invasive species that we are plagued with today. The first eyewitnesses told of great abundance of wildlife. I wonder what that would be like? The air would be so fresh, the rivers, clean and drinkable. Virgin timber, hundreds of years old. Great, massive trees reaching for the sky. What a wonder that must have been. Or head out West and see the sequoias before 90% were cut down. See the Plains teeming with buffalo and antelope. The rivers and streams filled with fish. Pure Eden. Migrating birds filling the skies, flying over for DAYS at a time, in the clean, fresh air – oh, to see that would be so amazing. I dream of earth in its untouched splendor, undisturbed by the hand of man. Buildings, farmed land, roads, industrial blight, all destruction, gone. A fantasy, but it would be amazing to see! These are the rules, and if anyone would like to participate in this fun, short exercise, please feel free to do so. I get to tag another five bloggers, who have no obligation to join in unless they so choose! So I shall nominate: Woodland Gnome, Silver in the Barn, Elizabeth de Grazia, Ellen Shriner and Being Margaret. 8. Do not forget to copy paste the entire passage on your blog post with a new topic for your nominees and copy & paste these rules with your nomination (at least five (5) bloggers). If you could meet anyone real or fictional, from the past or present, who would it be and why? What would you talk about? This entry was posted in Uncategorized and tagged creative writing, Free Style Writing Challenge, fun, stream of consciousness, words, writing, writing challenge, writing exercise. Bookmark the permalink. Thanks, Judy. Times were tougher than we have it now physically, but how beautiful the land and air must have been. You did this free-style? No hours of self-flogging to get it just right? Sheesh, Eliza, you’re a natural at this. And I simply love the shimmering paintings you’ve chosen to accompany this post. 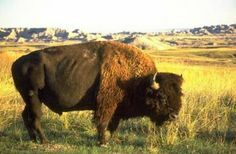 They estimate upwards of 30 million buffalo, maybe as many as 60 million, once roamed the Great Plains. Can you imagine the size of the herds? I guess Lewis and Clark saw much of what you describe. What a sight it must have been. Great post! Thanks, Barbara. 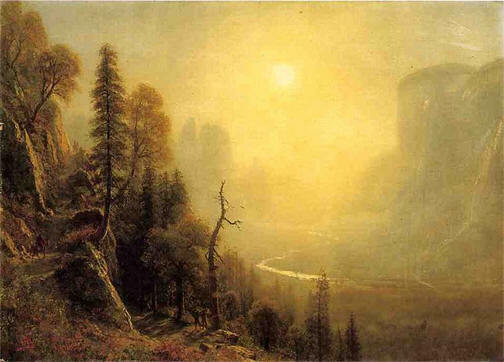 I love the way Bierstadt painted light – so amazing. And to think that all was only 150-175 years ago. Yes! This is great. What a perfect place and time to visit. Thanks, Mary. Wouldn’t it be cool if we could? Love the art you chose. I’m trying to remember which museum I’ve seen them in. So beautiful – I remember standing in front of the piece for a long time. Chicago maybe? Or DC gallery of art? 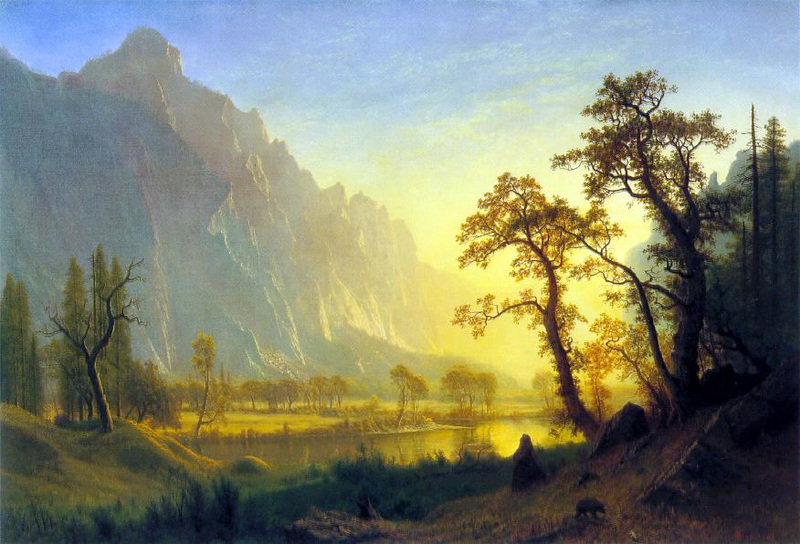 Bierstadt is so wonderful. There’s another one at the Nat’l Gallery that I love called Kindred Spirits–Hudson River School, I think by Asher B. Durand. It portrays Thomas Cole and William Cullen Bryant over a gorgeous landscape. Anyway, kudos to you for choosing a time and describing why you’d like to see it. To me it would be like naming my favorite book, an impossibility! Thanks, it is something I wish for a lot, to see a pristine wilderness. I envy your proximity to the Smithsonian museums, etc. I visited once more than 30 years ago, but saw only a small part of it. The museums are great. But I know what you mean about wondering what it was like before settlers. Sometimes I’m on the river or climbing somewhere and wonder what I’m seeing looked like to the first person mapping it. And the flocks and schools of fish…. Thanks so much, Robin. It’d be great to share that journey! I love your fantasy trips Eliza! Thanks, Dor. Aren’t they the best kind? 😉 Have a great holiday weekend. I have also thought often at what the land would look like when only Native Americans were present. I always try to imagine crossing the mountains, valleys and how it would feel. I like the comment about tree cover. That would be amazing to experience. Wouldn’t it be amazing? Thanks, Kim. Have a great weekend! Those pictures fit perfectly with your description of time gone by. Beautifully written Eliza. You are amazing! Simply beautiful. Thank you for sharing just 10 minutes of your time. Outstanding! I admire your seamless blending of words and images so much, Eliza. Writing well is hard. You make it look easy. Love the paintings and I love your idea of seeing precolonial America. Something I’ve never thought about but yes, it would be amazing. A new perspective to think about. Thank you! Thank you for your kind praise, Sharon. It is so appreciated! Hi Robin, thanks so much. Your grandparents stories must have been so entertaining. I would love to be a ‘fly on the wall’ in many historic events. Ancient Rome, watching the Pyramids under construction, the American Independence movement, the Elizabethan age, so much of history is fascinating! Thanks for stopping by and commenting! I would make that trip. When I read the descriptions of those early times they seem almost impossible — that maybe they exaggerated. A paradise. Yeah! I mean these things were so well documented so I have to believe but it is hard to imagine. The cod fishery for example … people could put a bucket into the sea and pull up a fish nearly every time! Like you, I sure hope we can stop the madness. I’d hate for my grandchildren to someday ‘wonder’ at the things so many people take for granted today — the small bits that are left. You certainly capture the greatness of what was once such an amazing wild and perfectly balances ecosystem.